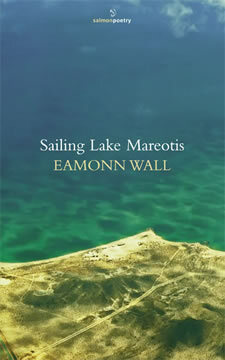 In his most wide-ranging work to date, Eamonn Wall probes and meditates on the histories, habitations, landscapes and ecologies of ancestral and newly-encountered places. A Tour of Your Country takes the reader from the American West to the Arctic to Wall’s native Wexford, and to some spaces in-between. Throughout, the poems record and explore the finely-tuned tension that exists between the road and home, between routes and roots, and between the physical world and how poets have been conditioned to observe and represent it. This new collection is a highly-charged literary work-one that engages in dialogues with an array of sources to create a new kind of map of the space that is common to us all. 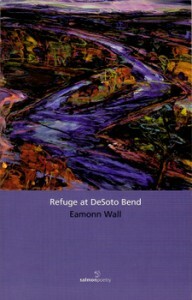 Eamonn Wall possesses a bright eye for detail – a preacher on a plaza in New Mexico, a juke box in a Courtown café, the arrangement of objects in a window in Co. Sligo, pine needles covered in snow in South Dakota – and it is frequently from these visual images that the poems in his fourth collection take flight. More than anything else, Refuge at De Soto Bend celebrates the joys and heartaches of time spent intensely in the light. One of the many striking themes in this collection, and in much of Eamonn Wall’s acclaimed work, is migration and the search for material and emotional shelter and refuge in unfamiliar locations. In “The Wexford Container Tragedy,” both refugees and locals grieve and seek to come to terms with a new world born out of tragedy. Eamonn Wall, himself an emigrant, recasts the Irish experience of emigration in the light of a new phenomenon: emigration to Ireland. Here is a poet in tune with origins, dislocations, and the quiet moments that crave for description. Eamonn Wall observes and describes a complex world. He listens and records for us some of the resonant truths this bright life reveals about nature, family, memory, hunger, and public and private life in contemporary Ireland and America. 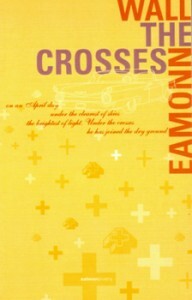 The Crosses is a striking metaphor which embraces many of the themes that Eamonn Wall explores in his third collection. He takes stock of what we lose and gain as we negotiate paths through an unstable world. Here is a work of mature affirmation which celebrates the deep bonds which bind us to land, water, and the streets of the present and past. With verve and wit, Wall deftly crosses and re-draws the boundaries of the contemporary Irish and American worlds. The Tamed Goose. New York: The Hale Press, 1990. Fire Escape. New York: Sunken-Isle Press, 1988. Fragments and Other Poems. Gorey: Gorey Arts Centre, 1981. The Celtic Twilight. Gorey: Gorey Arts Centre, 1974.